Amazon Underground APK for Android has been updated to 5.8.0.200. Although less successful in marketing the Fire Phone, Amazon still trying to reach users of Android in other ways. One of the Amazon’s latest effort is to provide an Android app that provides a portal application that is totally free. Amazon Underground is similar to the Amazon store are now available however only available in Android. Various applications are provided free of charge including some popular games like Goat Simulator, Angry Bird Slingshot Stella, Office Suite Professional 8, until Star Wars Rebels: Recon Mission. Amazon uses a different business methods to invite developers to provide games and free applications in the Underground. 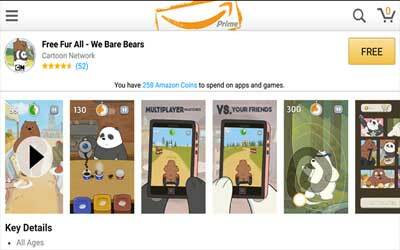 With no in-app purchases, Amazon will pay the developer a certain amount for each application / game that is played in every minute. Underground will be a long-term program that replaces the Free Games feature of The Day which previously applied in the Amazon Appstore. As with the Amazon Appstore, Underground must be installed manually. According to Amazon, they’re paying the developers on a “per minute played” business model in exchange for the developer waiving the normal IAP fees. Amazon claims to be picking up the “per minute” tab so the consumer will see it simply as a free premium app.